Not much happened this turn. My Witch King with the Shade bodyguards took the water province without any casualties. They are staying put while the Witch King searches for magic sites. The other battle I had put my big (combined) army in Remecia, the province just south of Lanka's capitol. TheDemon has moved nearly all of his troops back home, and at the moment he controls only his capitol and the province north of it. I'm leaving my army where it is; I don't plan on attacking Lanka's capitol directly with my army, but I'm not about to let him expand again. Since there's nothing else going on here, let's look at my army so I can talk briefly about how poorly I've organized it. In the back I have my veteran Chieftain with her never healing wound and Banefire Crossbow. She's also carrying a bunch of death gems. It's possible that she could get murdered and I could lose all of the gems, but unfortunately with the lightning from Arcoscephale's pretender crashing down all the time it is dangerous for me to put all the gems on any one carrier anyway. This turn I will be distributing the gems to their end users for safety. Then I've got 9 Witch Kings set to spam Dust to Dust or Raise Skeletons. I have saved a script that spams Shadow Blast in case it's necessary, but thus far I have been fighting chaff and I didn't want the AI to overreact and tip my hand. At this point Lanka might actually attack in force, so I switch the scripting to lean on Shadow Blast instead of Dust to Dust this turn. The latter spell is helpful against undead, and my scouts tell me that TheDemon's ganas are all up north where they cannot attack me. Next I have a handful of Enaries leading various ghouls and markartas who are scripted to hold and attack. 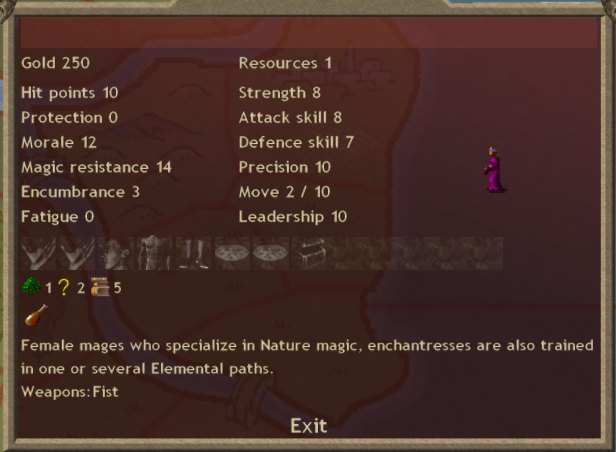 The Enaries are scripted to spam Body Ethereal, which should affect their troops first. The ethereal monkeys should theoretically make decent blockers, so they're a little closer to the front where they can join the fight and cover for the archers. Ah, the archers. Roughly 85 of them (I've lost some to Arco's lightning) in 5 different groups to mitigate acid rain or thunderstrike damage, mostly scripted to Fire Cavalry. If TheDemon's god shows up I intend to kill him as quickly as possible. Failing that the archers will shoot whatever they feel is most threatening, which is fine by me. In the front I have about a dozen cataphracts in two groups. I don't expect them to survive for very long, but I need them to buy the rest of this bizarre operation some time. They are set to Attack Closest. 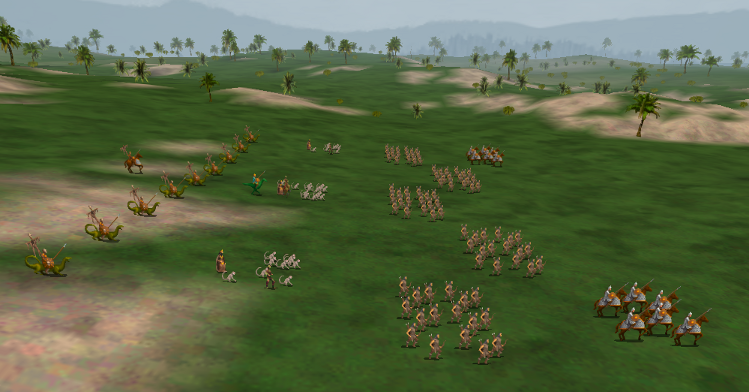 My hope is that by the time they die, the monkeys and some of the skeletons will be near the front of the archer lines. Of course, it's also possible that I will lose half of my everything to acid rain and thunderstrikes much faster than I expected and the whole thing falls apart. 4. Extract blood price from Arcoscephale (234 gold). This was an exceedingly dull turn. I finished building a lab over in Wicker Woods, which is a province that borders Hinnom. Way back when my Earth Mother was still alive she searched this province and turned up a magic site. Now that I have a lab on it I can start taking advantage of it by recruiting Enchantresses. As random paths they get 100% of FAWEN, 100% of FAWEN, and 10% of FAWEN. Combined with their single guaranteed path of nature there are many possibilities here, especially as regards forging. The downside to all of this of course is that I am oftentimes the world's worst forger. I would almost always rather use gems in battle magic or even summons. In any event I can't afford one of these right now, but they will definitely be an important addition to my forces if I can ever get around to it. The most interesting thing that happened this turn didn't happen to me directly. The upshot at least is that Hinnom has the Lankan capitol under siege, and buildscharacter has assured me that my part in the War of Lankan Containment is over. And so my armies are all pulling out, and beginning the march from the Lankan front toward Pangaea. Even with my blood sacrifices I have barely been able to keep my dominion steady at "near death" levels. I considered asking iod to stop sacrificing, but for all I knew he was hoping to pull off a domkill and move into my lands unopposed. If I let him know just how concerned I am about his dominion, it might only encourage him to heighten his efforts and finish the job. 4. Extract blood price from Arcoscephale (276 gold).